Cross the Channel to Calais heading for Burgundy. Overnight at Dijon with half board. Down to Lyon, then follow the Rhone Valley to the Mediterranean. 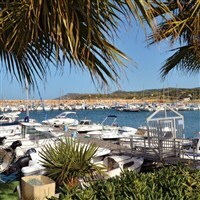 Arrive in the fine resort of Argelès for 6 nights half board at Hotel Le Lido. This is the southern end of the Golfe du Lion, which stretches round from the Camargue. Plagued with mosquitoes until they were eradicated in the 1960s/1970s, this coastal area has welcomed huge developments in the way of resorts, marinas and the entire infrastructure ever since. Day at leisure in Argelès. Excursion full of interest all day. Through the prolific wine producing region of Languedoc-Roussillon followed by sightseeing in Carcassonne, the historic walled city. Then we will consider the importance of the Canal du Midi which stretches 150 miles from the Mediterranean to Toulouse. Principally used for leisure nowadays, it was built by Pierre-Paul Riquet during the reign of Louis XIV, and was used to transport all sorts of goods. And it was a remarkable feat of engineering to manage water supplies from the Montagne Noir (Black Mountain) to keep it full. Another day, another country. We take you into Spain and one of the prettiest parts of the Costa Brava. We will spend some time in the popular resort of Roses before driving to the rocky inlets and promontories round Cadaques by way of a mountain road. And Cadaques is where Salvador Dali was inspired and ‘quenched by light and colour’. Up into the Pyrenees today. Firstly the area dominated by the Pic du Canigou at nearly 9,000ft, then, climbing the valley of the Tet, the curious area of the Cerdagne. More free time in Argelès and a short excursion to two of the other resorts in this southernmost corner of France. Beloved by artists is Collioure and nearby is Banyuls, famous for a sweet, red, dessert wine. Begin the homeward journey (a different route) with a crossing of the Millau Bridge, designed by Norman Foster. There is the fine scenery of the Massif Central all the way to Clermont Ferrand, then we continue to our overnight hotel in Nevers. Dinner, bed & breakfast. Back to Calais and an early evening ferry to Dover and home. A week beside the Mediterranean at Argelès, with a sea view from every room, a private beach and a pool. Fabulous excursions too  the walled city of Carcassonne and the Languedoc - Roussillon vineyards, Spains Costa Brava, Collioure and the Pyrenees.